Watch Sunday, June 21, 2015 at 4pm on WMHT TV. The Lincoln Highway was established in 1913 as America’s first transcontinental highway. An attentive driver with the right books and guides (and software) can still travel its route from New York City to San Francisco (or vice versa) and get a fascinating and surprising view of this land and its people, seeing things that one could never spot along an interstate. A RIDE ALONG THE LINCOLN HIGHWAY celebrates the joys and charms of traveling this great old road. The route of the Lincoln Highway tried to follow the fastest and most direct route across America from one ocean to the other — and early riders often ceremonially dipped their car tires in the surf at both ends of the journey. When the federal government began giving numbers to highways in the late 1920s, the Lincoln Highway became U.S. 1, then U.S. 30 from Philadelphia to Granger, Wyoming, then a series of other routes through Utah and Nevada and across California to San Francisco. 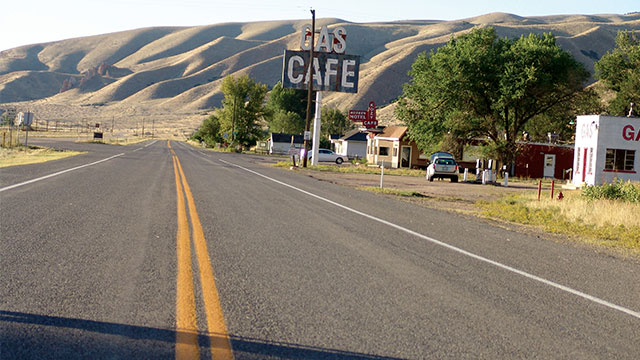 While recounting the history of the route, A RIDE ALONG THE LINCOLN HIGHWAY incorporates new footage of cross-country journeys with unexpected encounters that make traditional two-lane traveling so rewarding. Producer and narrator Rick Sebak and his crew talk to highway enthusiasts at the 2008 Annual Lincoln Highway Convention in Evanston, Wyoming, but they also stop to have coffee at the Brick Street Station in Woodbine, Iowa, where local folks have lovingly restored their red-brick stretch of the original highway. Lincoln Highway historian and author Brian Butko offers insights into the changing routes of the road. From 1913 through the late 1920s, when the Lincoln Highway Association printed guides for automobile travelers, the highway didn’t always follow the same path or go through the same cities; often a route that once went through the center of town now takes a bypass around towns and cities. Butko shows viewers some of the options available to Lincoln Highway fans traveling through his hometown of Pittsburgh, Pennsylvania. The program includes stops at the Lincoln Café in Mount Vernon, Iowa, at a cool little gas station in Grand Island, Nebraska, and at the General Store in remote Ibapah, Utah.